by David Saunders, King’s College London. On 6th January 1965, Bart Huges went into his bathroom and drilled a five millimetre hole into his skull. This event, far from a freak accident or an unfortunate DIY mishap, was the result of months of careful planning. Huges had spent the preceding days rounding up the necessary supplies for what he believed would be the most ground-breaking scientific experiment in human history: ‘an electric drill, a surgical knife, and a hypodermic syringe’. Like a physician describing a routine operation, Huges recounts anaesthetising his forehead, cutting into the skin to reach the skull, and pressing the drill-head against his frontal bone. A few minutes later, Huges had completed the first documented self-trepanation of the twentieth century. 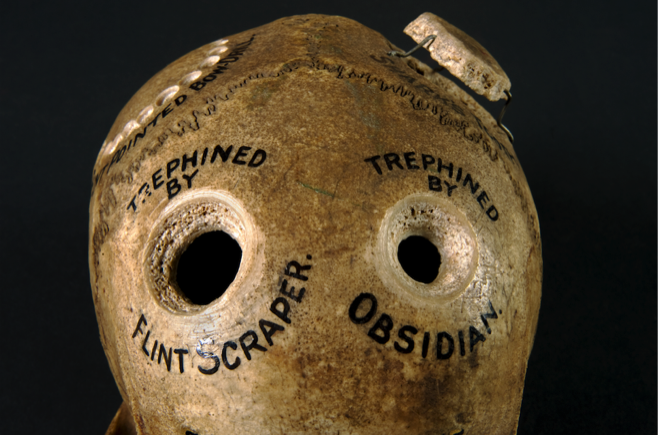 Since the Neolithic period, trepanation has been put to many uses: relieving pressure from head injuries, exorcising demons causing mischief, letting in light to stimulate the brain. Yet Huges was uninterested in these ‘irrational’ reasons; he had trepanned himself for the sake of medical research, pursuing definitive proof for his theories on human consciousness. According to Huges, certain evolutionary missteps in human development had deprived mankind of full, uninhibited consciousness. When man evolved to stand upright, he argued, gravity began reducing blood flow to the brain, starving it of oxygen and glucose and thus limiting the mind’s intellectual and creative capacities. After an intensive programme of self-experimentation, involving everything from standing on his head for hours to repeated LSD trips, Huges concluded that the only permanent solution to this problem was to drill a hole into the skull. By opening up the ‘expansion possibilities’ of the skull, each heartbeat could be fully expressed in the brain, thus restoring blood flow and the ‘lost paradise’ of subjective experience. A trepanned skull discovered in Canary Islands (1871-1930). Once a medical student himself, Huges hoped that the medical establishment in Britain would come to recognise the revolutionary potential of trepanation. The theory of ‘brainbloodvolume’ appealed to the ‘philosophical materialist’, Huges reasoned, offering a precise, rational, and scientific way of discussing subjectivity and transcendent experience. Perhaps unsurprisingly, doctors in Britain were unimpressed by such claims, instead rewarding Huges with a three-week spell in a psychiatric institution. Therefore, rather than entering the canon of medical knowledge, trepanation was forced underground, where it found a small but loyal group of followers. These disciples, largely drawn from London’s bohemian counter-culture, forged a ‘trepanation movement’, which sought to educate the uninitiated. Denied established channels of expression, the movement improvised a path through popular culture using whatever resources were available: folk music, avant-garde film, press interviews, and even an election campaign under the banner of ‘Trepanation for National Health’. Despite these innovative strategies, trepanation remained a hard sell and uptake was severely limited. In many ways, trepanation provides a unique insight into the counter-cultural pursuit of new kinds of subjectivity during the Sixties in Britain. Huges’ theories reveal fascinating and often overlooked interactions between medicine and counter-culture, leading to an unlikely synthesis of diverse models of understanding. Positioned at the fault-lines of the medical, psychological, and spiritual, the trepanation movement forged new ‘technologies of the self’ in the scalpel and the electric drill. The study of medical theories, no matter how unusual, provides key entry points into explorations of selfhood. When investigating such procedures, the natural response is to ask: did it work? In this light, trepanation seems of little historical interest, situated completely outside of accepted knowledge. However, medical histories must extend beyond questions of efficacy. As Athena Vrettos argues, medical models provide insights into how historical actors conceptualised their bodies and minds. Therefore, the theories and cultural tactics of the British trepanation movement provide an alternative lens through which to explore the intellectual and conceptual worlds of Sixties counter-culture. Joseph Mellen, ‘Bart Huges: Questioned by Joe Mellen’, Transatlantic Review, 1966-67, 23, 31-39, 34. Stanley Finger and William T. Clower, ‘On the Birth of Trepanation: The Thoughts of Paul Broca and Victor Horsley’, in Robert Arnott, Stanley Finger and C. U. M. Smith, eds, Trepanation: History – Discovery – Theory (Lisse: Swets & Zeitlinger, 2003), 19-42, 28. Bart Huges, Homo Sapiens Correctus, 1962, F Am-Mi H891h, Deering Library, Illinois, special collections. Joseph Mellen, interview by author, 21 February 2014. Christopher Turner, ‘Like a Hole in the Head’, Cabinet, 2007, 28. John Ezard, ‘Seeking a Cross on the Fringe: John Ezard meets the ‘silly’ candidates for whom campaigning is a serious business’, Guardian, 4 June 1983, 3. Michel Foucault, ‘Technologies of the Self’, in Martin, Gutman and Hutton, eds, Technologies of the Self: A Seminar with Michel Foucault (Amherst: University of Massachusetts Press, 1988), 16-49. While Foucault was largely referring to the practices of Greco-Roman philosophy and early Christian asceticism, the term is here reconceptualised in a more literal, mechanical sense. Athena Vrettos, Somatic Fictions: Imagining Illness in Victorian Culture (Stanford: Stanford University Press, 1995), 2-3. Very interesting piece. Of course, there are now many videos online that will show anyone else who is interested exactly how you go about doing this with a Black and Decker power drill. Forced underground, the practice may once again find itself on medical agendas. I did not know about the 1960s and 70s part of this story.